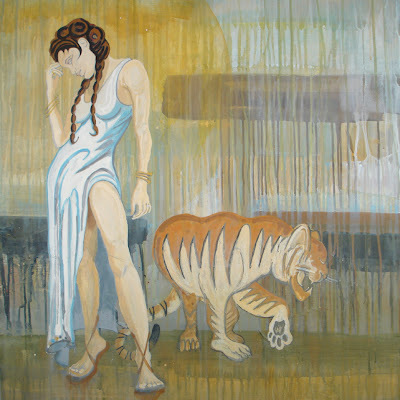 I've recently completed a painting titled "The Lady and The Tiger". 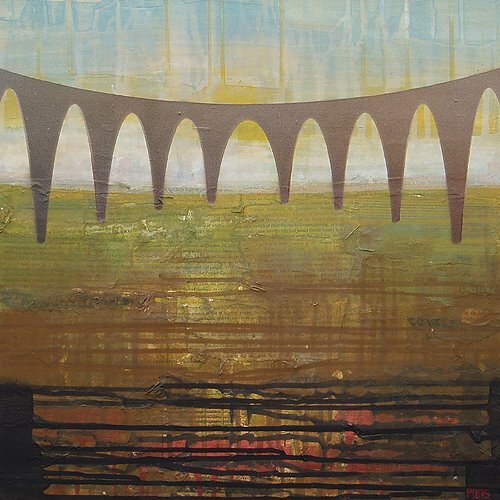 This piece was a commission for two of our best friends living in Charlottesville, Virginia. Below are some images of the generative studies for the final painting as well as a 12"x12" canvas study I did of the tiger. "Tiger Study (Mini)" was a real breakthrough for me in terms how I typically work. 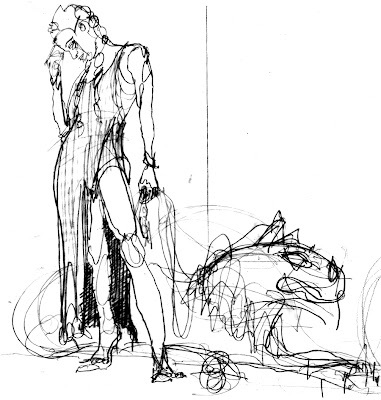 While completing the background for "The Lady and The Tiger" I worked on full-size sketches of the figures. I took one of the pencil sketches of the tiger and pasted it onto the 12"x12" canvas. Something about seperating the sketch from the main painting allowed me to paint with more freedom. I was able to experiment on the mini and then take it to the larger painting. 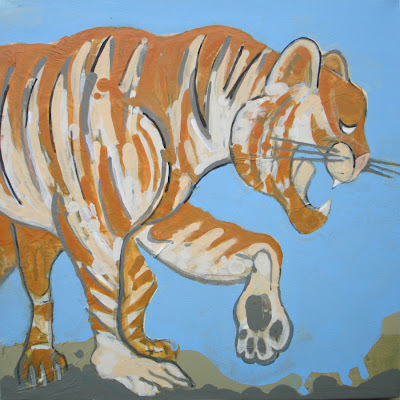 "Tiger Study (Mini)" now resides in the home of a family friend. 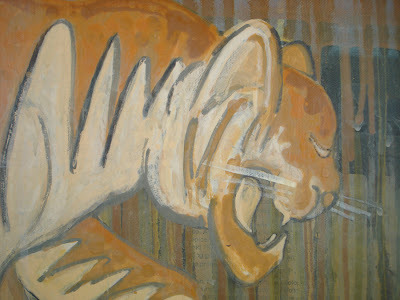 For those interested in the content of the paintings, they were inspired by the short story "The Lady, or the Tiger?" by Frank R. Stockton. Although instead of an allegory focused on our human nature and the decisions we face, I chose to show both the princess and the beast simultaneously. 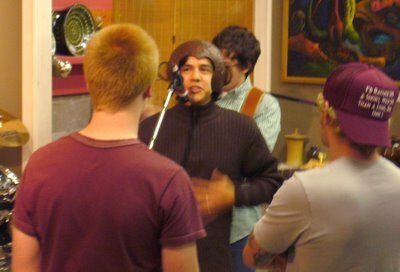 I was interested in portraying a pensive and statuesque figure with the tiger in the background acting as both companion and guardian. Below are some pics of student work recently completed by students Max Harvey and Tommy Cox. 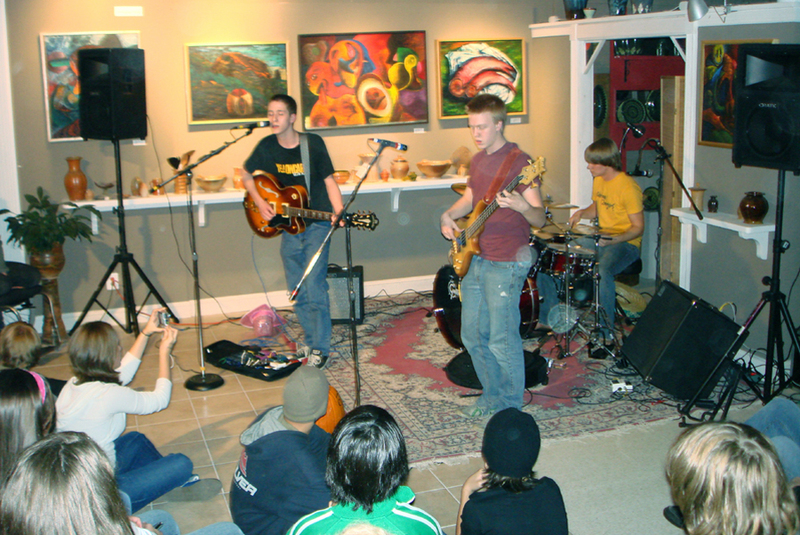 November 2006 officially marked the one-year anniversary of the PONSHOP studio space at LibertyTown Arts Workshop. On behalf of Scarlett and I, we're grateful to have met so many great and supportive people. -Enjoy! 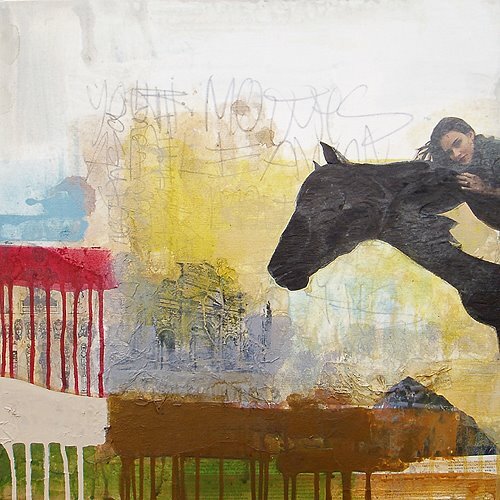 "This Will Happen..." by Max Harvey , spray paint on composite panel 24"x48"
Max Harvey has been taking weekly private classes at the studio since March 2006. 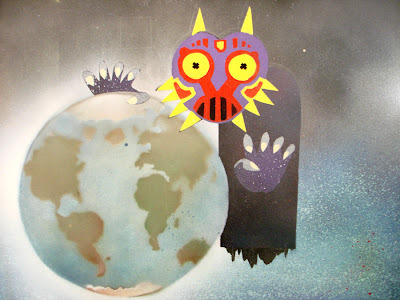 Over that time he's done mixed media collage pieces, stencil and spray paint designs, and surreal watercolor landscapes. This piece was by far his most ambitious and incorporated at least 12 different stencil templates and hours of drawing and cutting. 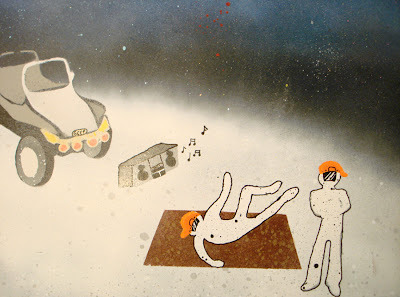 Max draws inspiration from Hip-Hop and Techno music as well as video game and science-fiction iconography. Max's work will be on exhibit at LibertyTown Arts Center's Annual Student Show from January 5th-31st 2007. 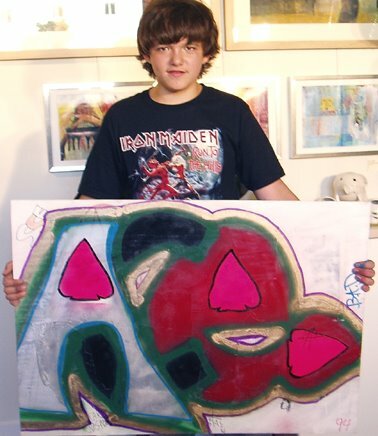 Tommy has an inherent love for two things: Skateboarding and Art. 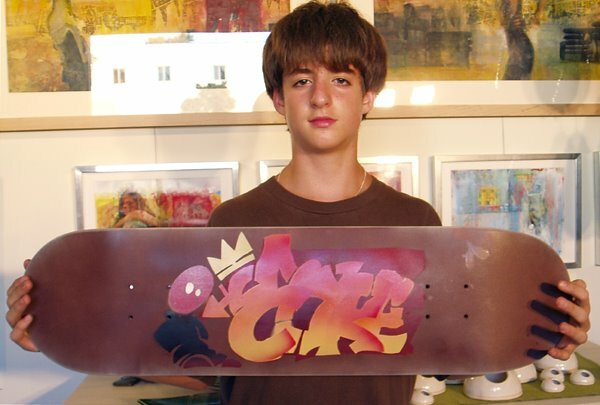 It came as no surprise that he was excited to participate in the "Skate to Create" workshop held in November 2006. 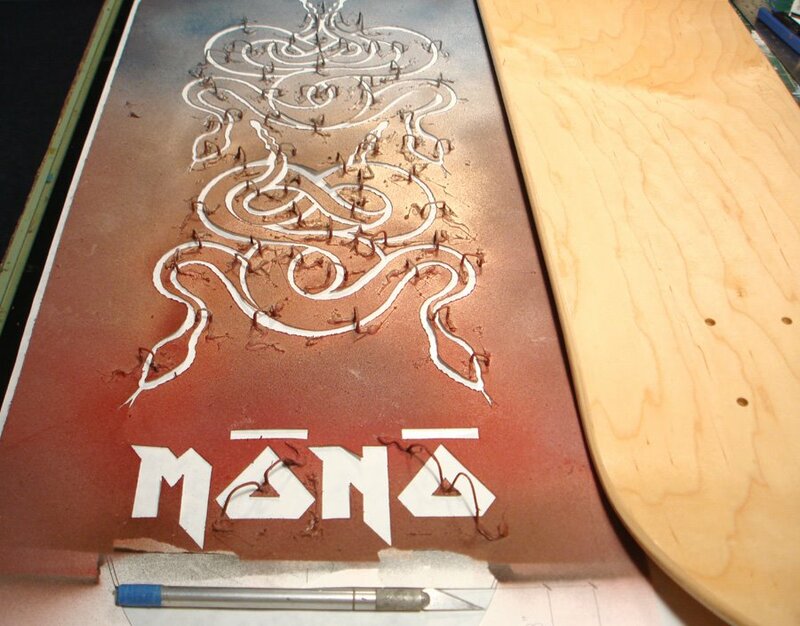 Within a span of three 2-hour sessions, Tommy conceived and executed his own custom skateboard graphic using stencils and spraypaint. 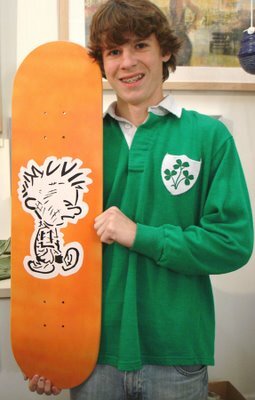 Tommy wanted to bring one his own cartoon characters to life on a skateboard deck. Below are some images of Tommy in action. 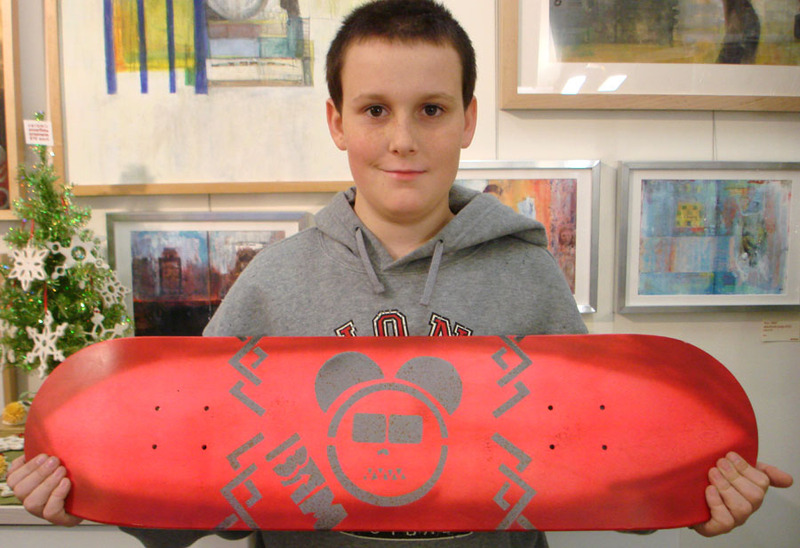 Tommy's "Falling Cat" deck will also be on display at LibertyTown's Student Art show in January. Good Job! 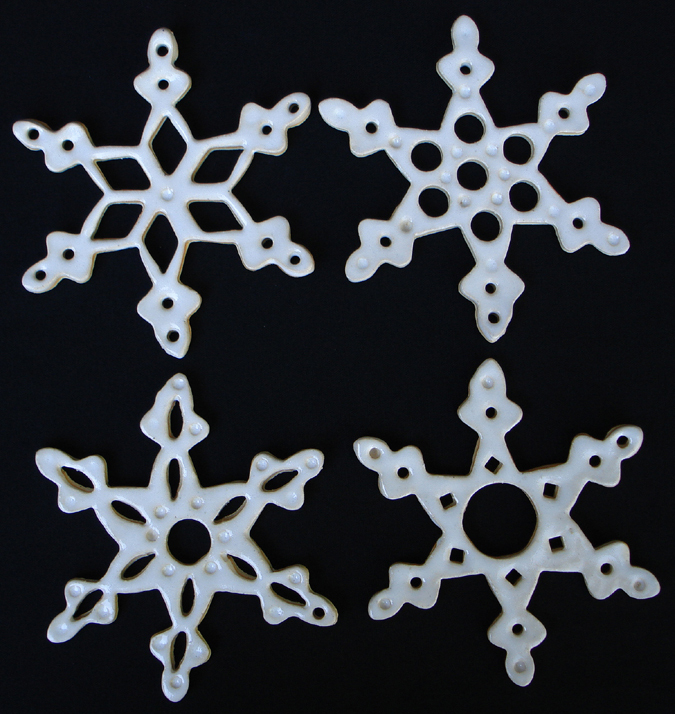 Handmade Ceramic snowflakes give the personal touch to any Christmas tree trimming. Scarlett's ornaments, like snowflakes, are special since no two are alike. All pieces are glazed white and include a red ribbon for hanging. Whereas the typical ceramic ornament that you made in grade school bends the branches to the ground, these pieces are sufficienty lightweight and elegant. Ceramic snowflakes by scarlettwares are $10 each and can be shipped with ease. If interested in purchasing, contact spons@scarlettwares.com. 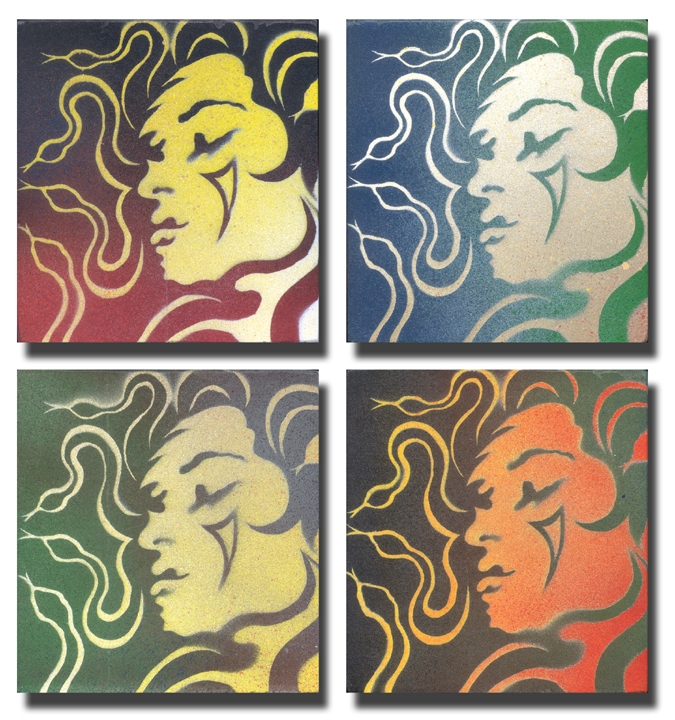 Also available in our studio and on display at LibertyTown's main gallery this month are the Medusa (Mini) paintings. These wood pieces are 5.5" x 5.85"x1" and are individually spray painted. The Gorgon Goddess is, according to myth, so hideous that her visage turns viewers to stone. I chose to portray her as a young heretic, sensual and powerful. These pieces are $25 each (plus shipping) and come with a saw-tooth hanger on the back for display. Availability is on a first come, first served basis so visit the PONSHOP or contact me at shop@ponshopstudio.com. Of course, Skateboarding and Art mix together at the PONSHOP. These new shop decks are the sure fire way to get a kid to freak out Christmas Morning. 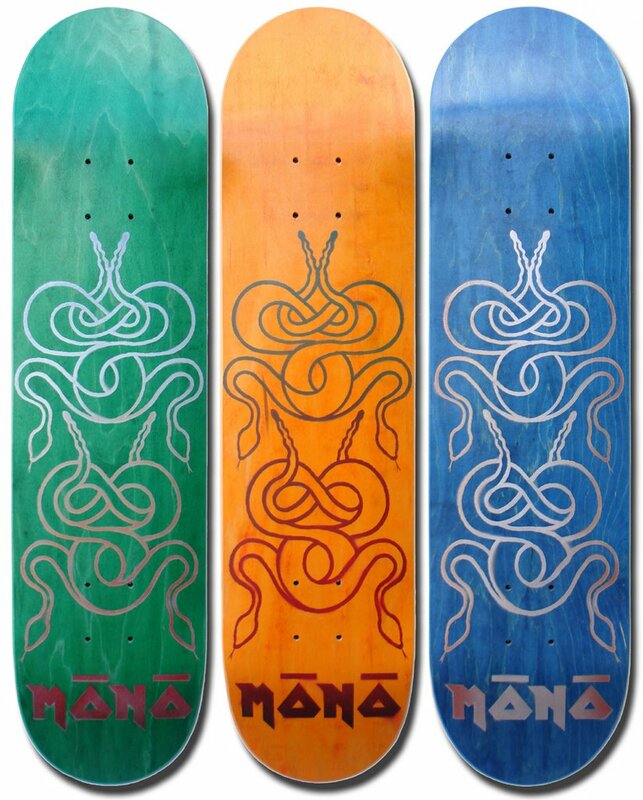 All decks are made from 100% North American Hardrock Maple and come in three different widths: 7.5", 7.75", and 8.0". 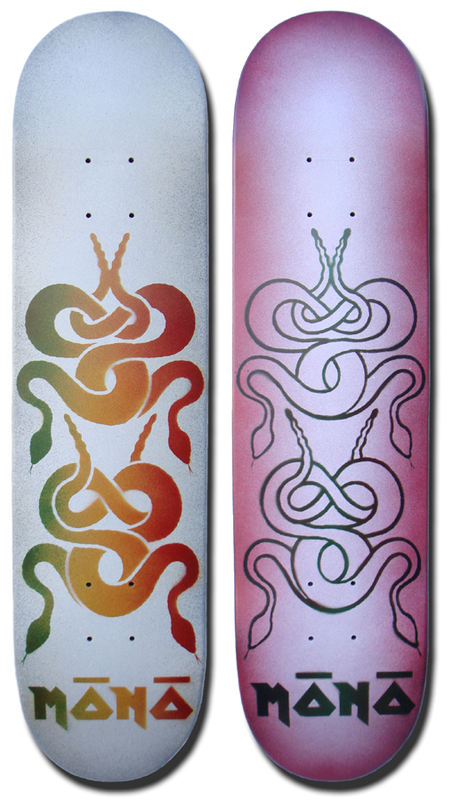 The PONSHOP "Snake" shop decks are $45 (plus shipping) and come with griptape. 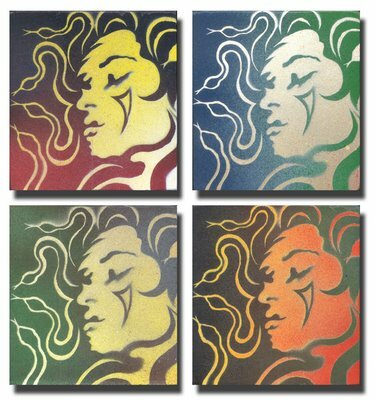 "Stencil" is derived from the French word estencler which means to decorate or adorn with bright colors. 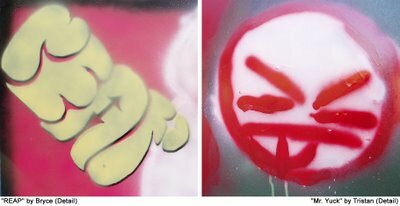 It is very much apparent when looking at today's pop media and trends that the stencil has reached its critical mass in terms of popularity and accessibility. For instance, Comedy Central's graphics and logos emulate the street-born and hastily sprayed text that one would find on any lamp post, mailbox, or bare wall on the Bowery or Mott Street. 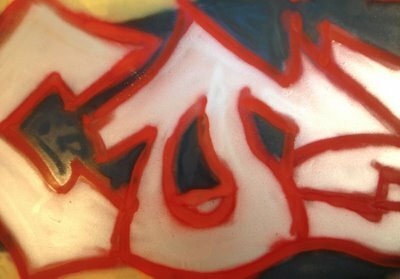 T-shirt and skateboard graphics also include the classic "drips" and "spots" that are found in graffiti tags and murals. The fact that stencil art and graffiti has attained mainstream appeal doesn't really shake my stance on the craft. 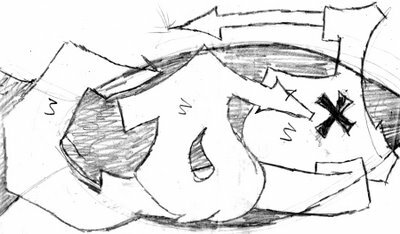 In fact, just like any other medium, I'll keep on pushing it until the work becomes something other than just a stencil. And for those of you who think it's as easy as cutting and spraying - give it a shot and you'll find that there are many variables when it comes to creating a great graphic. Having said all that, below are some pics of student work from our Autumn Workshops. Once again, I was really impressed with how much these kids applied themselves to their projects as well as the collective support and constructive encouragement they gave to one another. Allison put together a 3-stencil graphic from her freehand drawing of the Beatles "Yellow Submarine" CJ took his Calvin and Hobbes sketch and transposed it into a 2-layer stencil graphic. Bryce enlarged his "robo-bunny" face and applied pattern and background colors. I worked with Robert previously in a "Skate to Create" class this past summer. 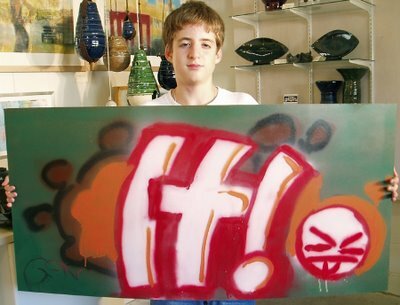 Once he saw the challenge that comes with creating a "freehand" spray paint mural - he was ready to take it on. I showed him my library of graffiti literature, including "The Art Of Getting Over" by Stephen Powers as well as "Style:Writing From the Underground" (Stampa Alternative in association with IGTimes). Rob's drawing skills are well-grounded, but he wanted to emulate the "Wild Style" Graff designs of the late seventies. We worked on his lettering and composition in the sketches all the while knowing that he'll have to pull this off on a 24"x48" piece of masonite. The "Broken Bones" Benefit Party for local skater Mark Eyestone was a great success. 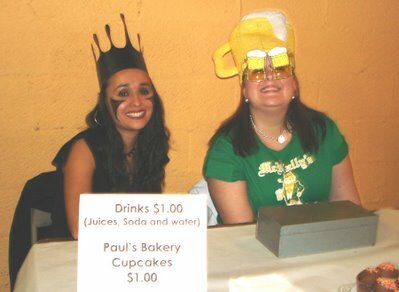 Over 100 people attended this event on a mild Saturday evening to raise over $1,000.00. All proceeds from the benefit will go towards taking a chunk out of Mark's medical costs accrued since he underwent knee surgery in August. Organized by Magic Bullet Records and PONSHOP Studio, this party brought the skateboard community together for a special cause. 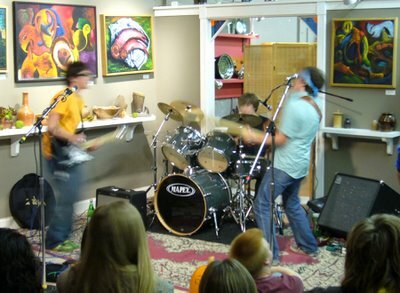 Local bands Rocky's Revival and The Byzantines laid down some great music that evening and the much anticipated skate video by Patrick Brastrom made its debut to an enthusuastic crowd. 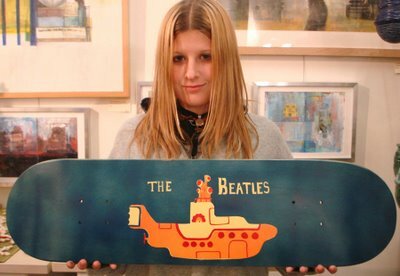 A Silent Auction was also held throughout the party featuring skateboard art by Rob Landeck, Brent Eyestone, and Gabe Pons. Zac Childers donated a small artillery of skateboard products including shirts, hoodies, DVDS, and more. Max Harvey (aka DJ Skull Kid) wrapped up the evening spinning tunes from his two turntable mega-setup. "There is a stereotype that pervades today’s society when it comes to skateboarding. 'Extreme Sports' are all the rage these days, depiciting thrill-seeking teenagers doing anything that’s over the top and explicitly dangerous. Unfortunately, MTV’s Jackass generation is being spoon-fed all the hype and very little substance when it comes to skateboarding – just like the energy drinks that they want you to consume. All too often skating is being used as a tactic to sell deodorant, cell phones, Big Macs, and video games. 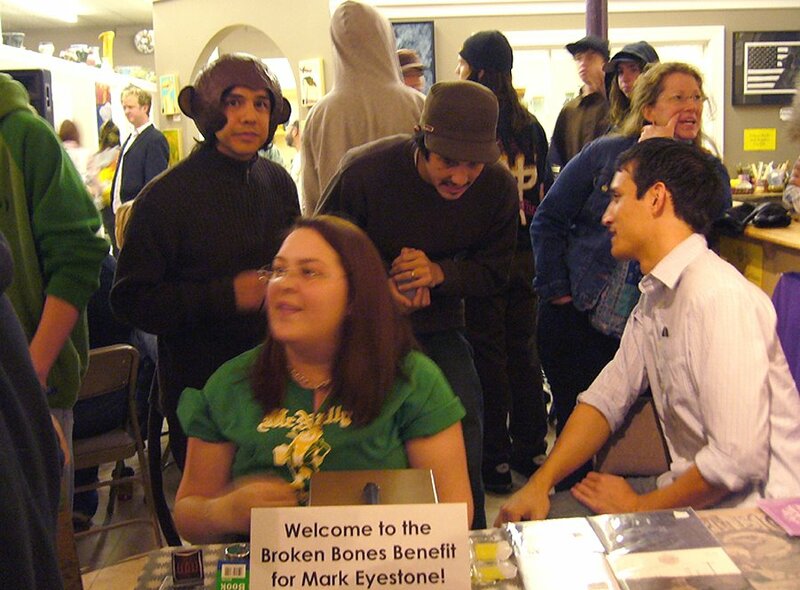 When I met Mark Eyestone for the first time at Fred Skates, I knew that he was in the skateboarding game for all the right reasons, not because it made him look cool or popular, and it definitely wasn’t the money or fame. Mark has an inherent love for skating, and it shows not just in his abilities on a board, but in the way that he treats his friends and all the people around him. Of course, tonight’s event is to show Mark our support and to help him recover from his knee surgery. But tonight is also for the kids: skaters, non-skaters, and skaters to be. 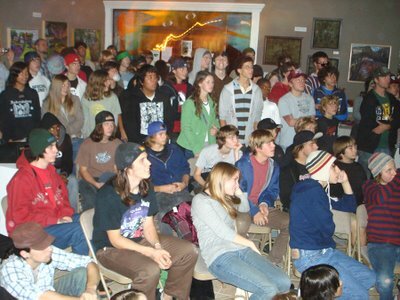 This party is for the parents and adults in the audience so that they can see how talented and creative our youth really are. Fredericksburg’s skateboard scene is alive and well today because of people like Mark, who smile when they’re rolling on a plank of wood and wheels." 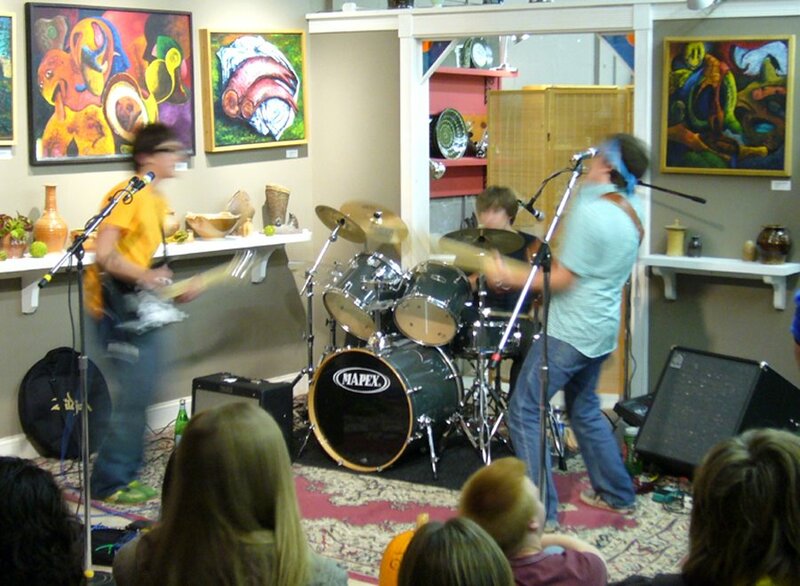 Phelan , Luca, and Zach on fire. On behalf of the PONSHOP, Magic Bullet Records, and Fredericksburg Skateboards, we'd like to thank all the people that made the party such a success: Dan Finnegan and the LibertyTown Staff, The Eyestone Family, The Suhy and Pons Families, The Byzantines, Rocky's Revival, The Harvey Family, Patrick and Mr. Paul Brastrom, Janet and Charlie Hahn, Rob Landeck and family, Rachael Taylor, Shelley Richards, Daniel Bachman and family, Phelan O'Connor, Zac Childers, Chris Hupman, Adam of the Fredericksburg All Ages Shows, The Skaters of Fredericksburg, and to all the parents that continue to support and encourage their kids in doing what they love, however crazy it may be. 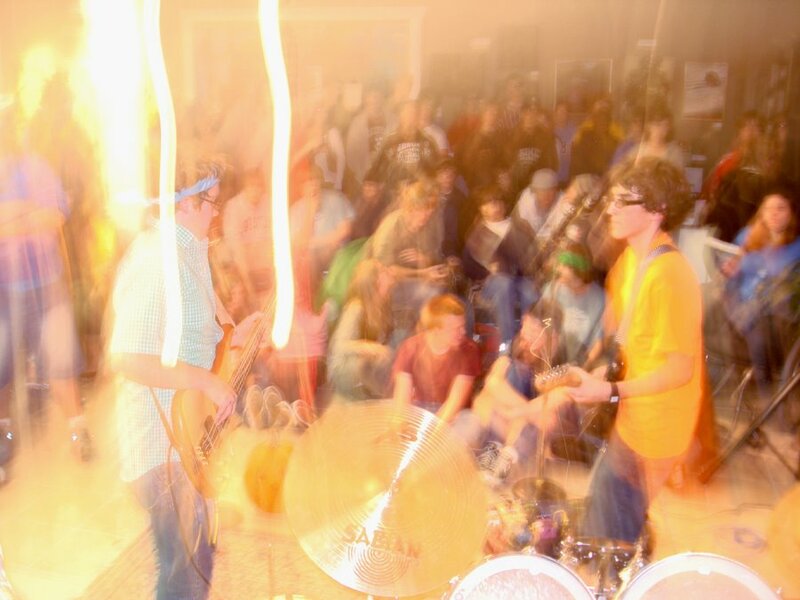 The PONSHOP is excited to announce that we'll be teaming up with Magic Bullet Records to host a benefit party for friend and fellow skater, Mark Eyestone. Mark is co-owner of Fredericksburg Skateboards and has dedicated his career into promoting and preserving skateboarding in his hometown of Fredericksburg. Last May, he was injured while skateboarding, which resulted in a significant amount of knee surgery including ACL replacement. 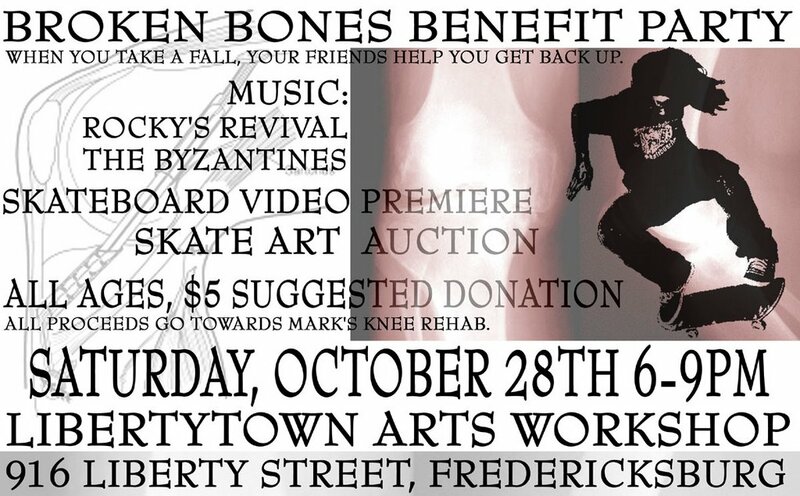 Now that the healing has begun, the hospital bills won't go away anytime soon - so as a way to show support from the local skate community and help Mark to a speedy recovery, we're throwing a party to help him get back on his feet…and back on his board! First and foremost, we plan on having a FUN time Saturday night. 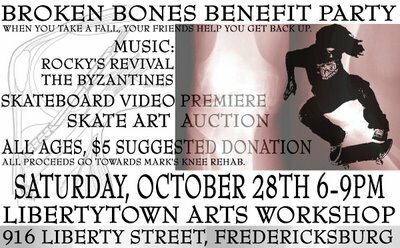 Our friends, The Byzantines and Rocky's Revival will be providing live music and fellow Fredericksburg skater Patrick will be premiering his skate video featuring all the local youths shredding it up. 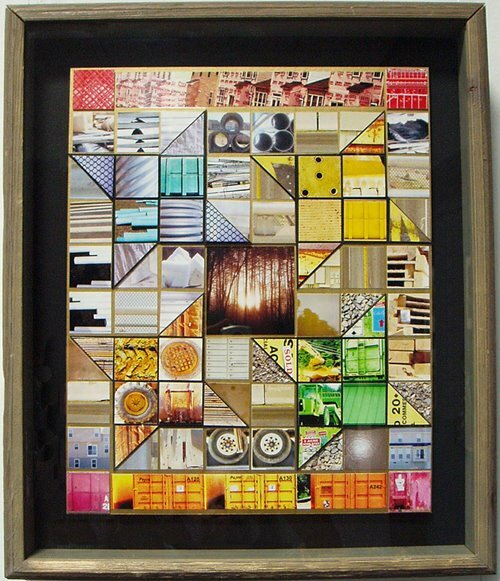 We'll be holding an auction which will feature artworks from Brent Eyestone, Rob Landeck, and of course the PONSHOP. All of our efforts are to raise money to aid in Mark's recovery so come on out and show your suppport! Ohh yeah, it will be Halloween weekend, so feel free to rock your costume to the event. Halloween is my wife Scarlett's favorite holiday so you know she'll represent! 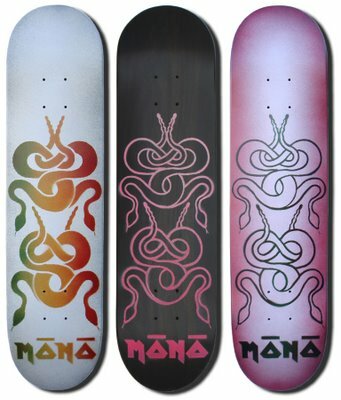 The PONSHOP is now carrying the first run of our "Shop" Decks. Titled the MONO (pronounced moe-no) Snake Decks, these boards are made from top-quality North American Hard Rock Maple and feature a good concave and solid pop. 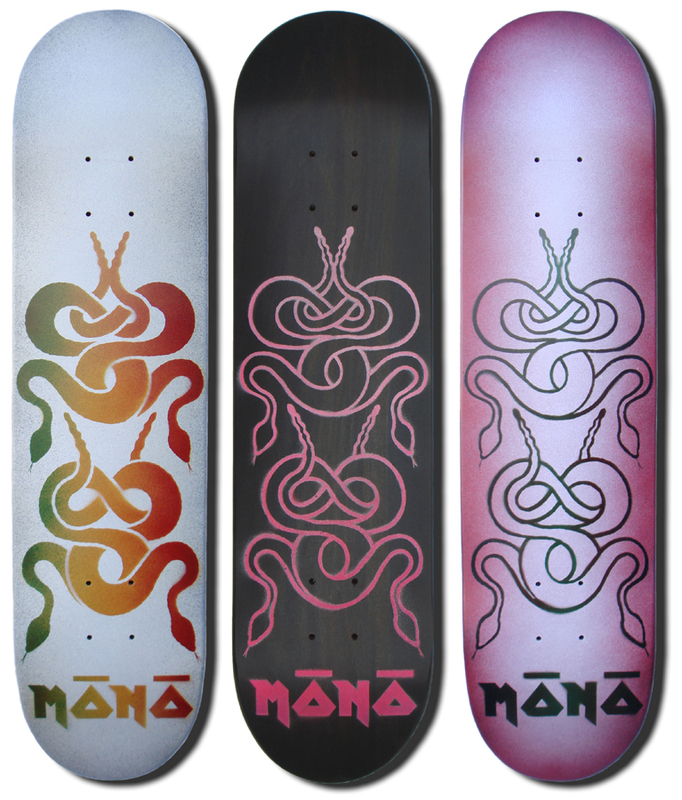 Decks come in two widths: 7.5" and 7.75". The Shop Decks differ from the art decks that I've been making in that we're encouraging these decks to be ridden, used, and abused. Instead of using four stencils and a background color to fabricate the art decks, I'm using one stencil to simplify the process and retain a reasonable price point. Shop Decks are available for purchase at the PONSHOP Studio for $45 plus tax which includes griptape. For those of you who can't get to the shop and want to buy one, email me at shop@ponshopstudio.com. 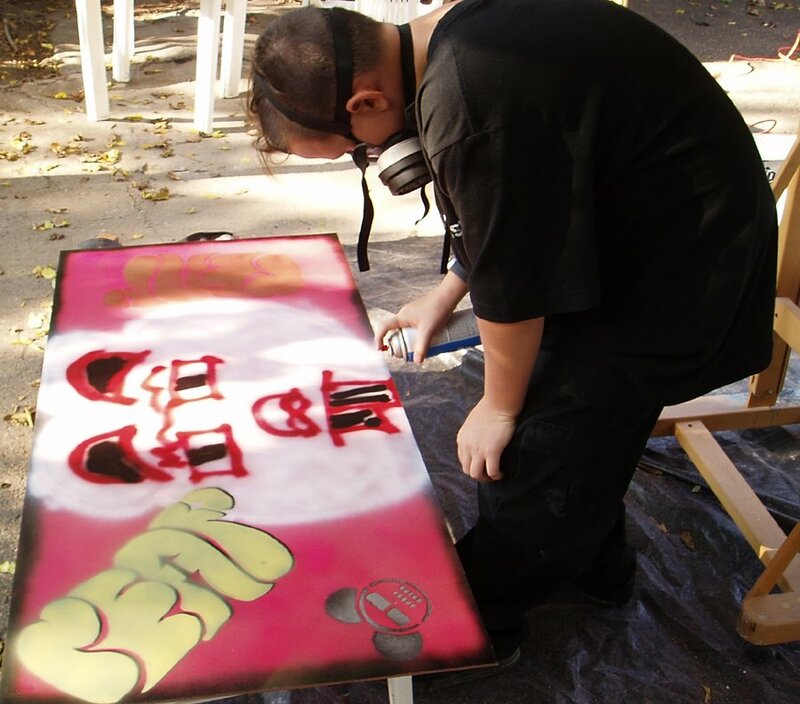 Below are some photos from September's "Intro to Street Art" Workshop. 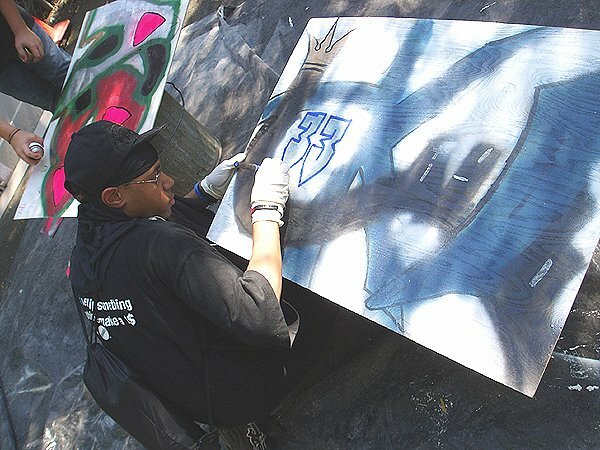 Students had three 2-hour classes to adorn a 24"x48" sheet of masonite with spraypaint, stencils, and paint pens. Both Bryce and Tristan had alot of ideas and enthusiasm towards their projects, and my challenge was to help guide their way. They were very good at sharing and supporting one another's work and that's a great quality to develop. The compostitions seen below started off as simple pencil sketches and studies in their sketchbooks and evolved into full-color fun. Good Job guys! Bryce started by cutting a stencil of "REAP" and then picked up spray paint cans to create the "Bunny" Graphic. Tristan practiced Line and Fill with His "It!" graphic while experimenting with clouds and shadow. This summer, (June 22nd-July 27th), four students participated in a PONSHOP workshop which was an introduction to architectural design and how it shapes our everyday lives. 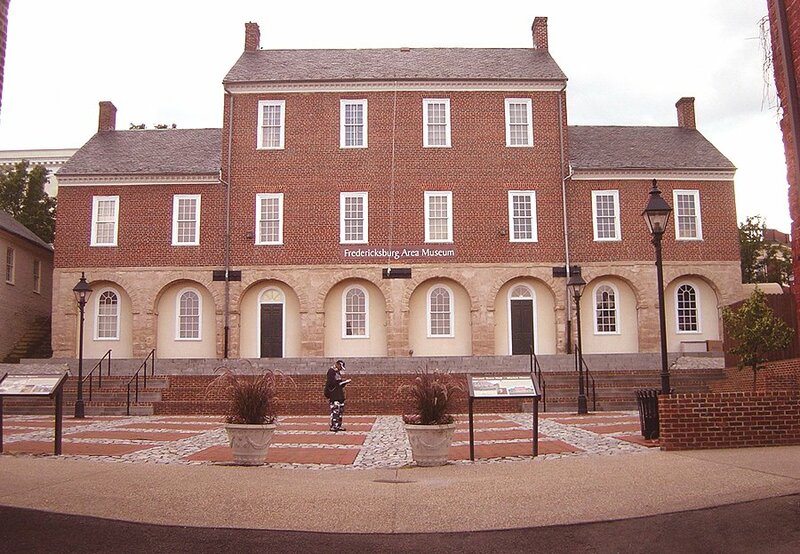 Sessions were weekly two-hour classes where participants used drawing as a means of further investigating their environment - in this case, Fredericksburg's downtown. 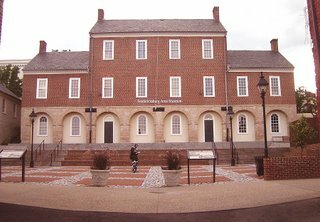 I engaged the students in a design exercise where they studied a public plaza adjacent to the Virginia Historical Museum in downtown Fredericksburg. The students became familiar with the project site by creating maps, perspective sketches, and analytical sections. We used these drawings to generate a discussion of what the current condition of this public space is and how we could improve its function and quality. 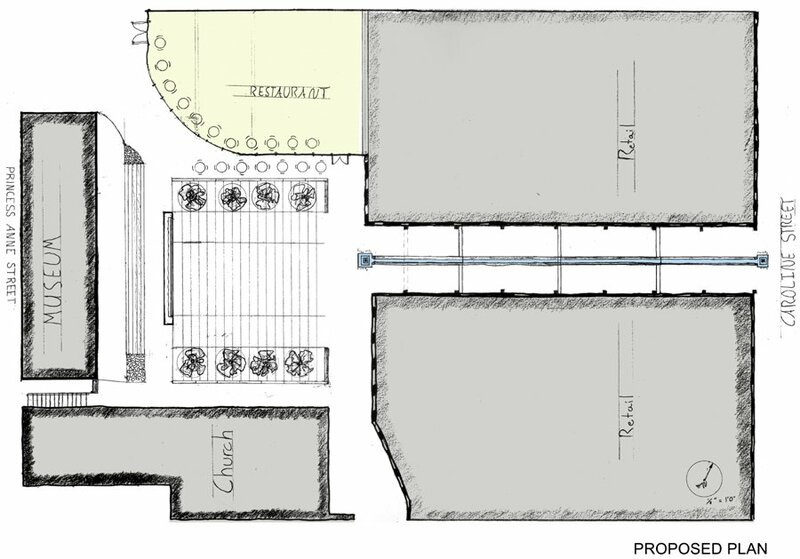 1) The plaza does not seem to be used avidly by pedestrians and local merchants. As a public space, the plaza is "inside out," meaning that all the businesses and buildings which envelop the plaza turn their back on it - resulting in a backyard condition. The students immediately commented on how the perimeter buildings are in a state of disrepair. How can we change this? 2) The historic downtown, albeit rich in historical sites and posessing a viable commercial district, doesn't offer a place in the center of the city for kids to interact and play. How can we create a space for children and their families to hold activities? 3) What makes a good (and safe) public space is not the amount of fences and street lights, but rather the integration of several activities: dining at restaurants, shopping at stores, a place to recreate and meet other people, as well as providing habitation so that residents feel a sense of "ownership" of the public realm. 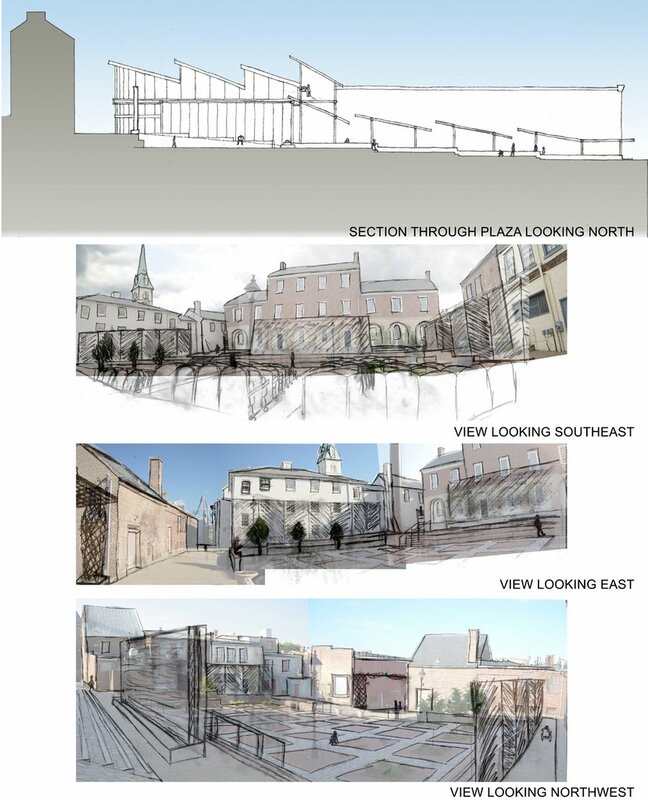 The images below illustrate the students' solution to improving the plaza by transforming it into an outdoor theatre. One student remarked on how we can bring the spirit of a Drive-In movie theatre back. 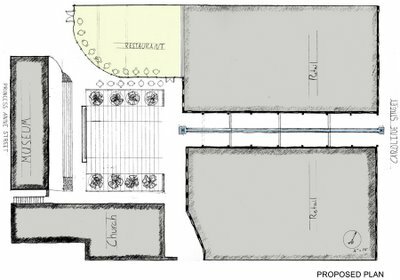 Architectural features like glass partitions and wood canopies would be a means of creating a richer sense of scale to the plaza while concealing some of the visual "clutter" of the existing buildings. 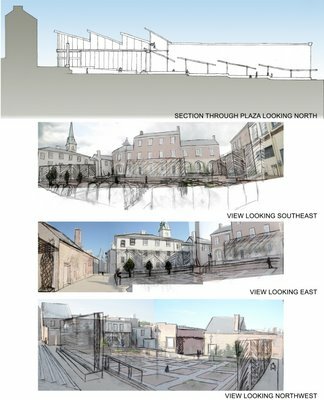 In addition, one of the existing buildings would be reconfigured to open up to the plaza - activating the space as a place to enjoy a meal or read a book. The plaza can be multi-functional: an outdoor theatre and concert pavilion, a restaurant patio, a place to see and be seen. Congratulations to Ty'Rel, Sabrina, Rebecca, and James - their enthusiasm and hard work resulted in a great summer workshop. Scarlett and I both placed in this year's "Uniquely Fredericksburg" Juried Art show held at the Central Rappahannock Regional Library (1201 Caroline Street, Fredericksburg,VA). 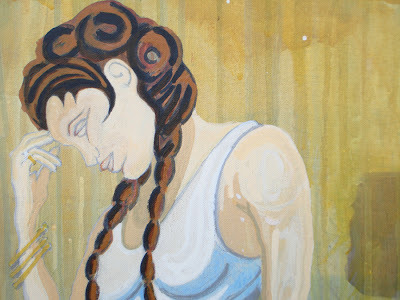 Scarlett's piece "Sixty Acres A Day" received First Place in the Mixed Media category, while my painting, "Water Is Our History" came in second in the Mixed Media category. When it came time to make these pieces, we both wanted to reflect on the town that we recently moved to as well as give some kind of commentary on where the city has been and where it's going. Sixty Acres a Day was inspired by all the development that is happening in our area. Therefore, I wanted to create a piece where the traditional contrasted the new. The layout of Sixty Acres a Day is a traditional pinwheel quilt pattern that is constructed out of photographs taken of local construction sites. To initiate this piece, I spent a week with my son Diego and my mother Marleine driving around our county looking for construction sites to photograph. It wasn’t very difficult and I didn’t have to drive very far before I had a 100 or so photos. The most surprising realization that I made during that week is the amount of destruction that occurs to create this new semi-urban landscape that Fredericksburg is quickly becoming. The amount of dump trucks and 18 wheelers carrying freshly cut trees and construction equipment is astounding. The progress of leveling our hills for a new fast food restaurant or super store that already exists twice over in a 20 mile radius is overwhelming. It’s the pace really that is hard to grasp. I have to ask, ”Is it worth it?” Replacing our dogwoods and cedars, our wildflowers and cardinals for another pharmacy? According to my research if we continue developing the way we have been we will be destroying an average of sixty acres a day in the Commonwealth." Below are my entries "Water Is Our History" and "La Caballera"
The painting Water Is Our History is a reflection on the prominence of the Rappahannock River in the area and it's relationship to the history and culture of Fredericksburg. Studied closely, the composition is a theoretical cross-section of our city's history - a town strategically placed by the river for trade, a city ravaged by fire, flood, and war. 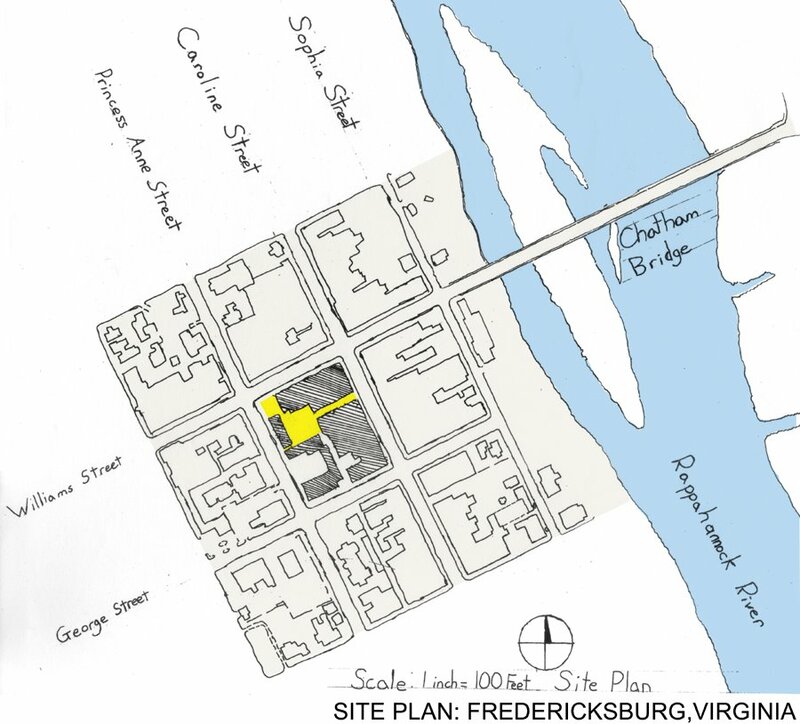 Today Fredericksburg is at a critical cross-roads in its identitiy. This small "Civil War Town" has great cultural and historical precedents manifest in the environment, yet it is also experiencing the growing pains of being consumed as another suburb of Northern Virginia. 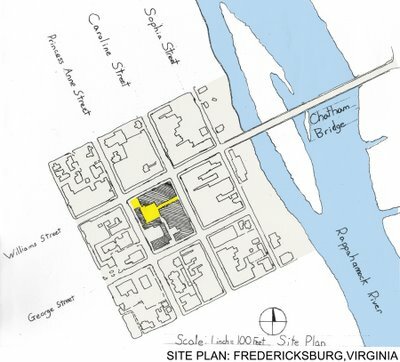 Fredericksburg as a city is in danger of being enveloped by its own suburban sprawl - where shopping malls rename themselves the "Town Center" and the locals no longer look to the river for their orientation, but to the interstate. 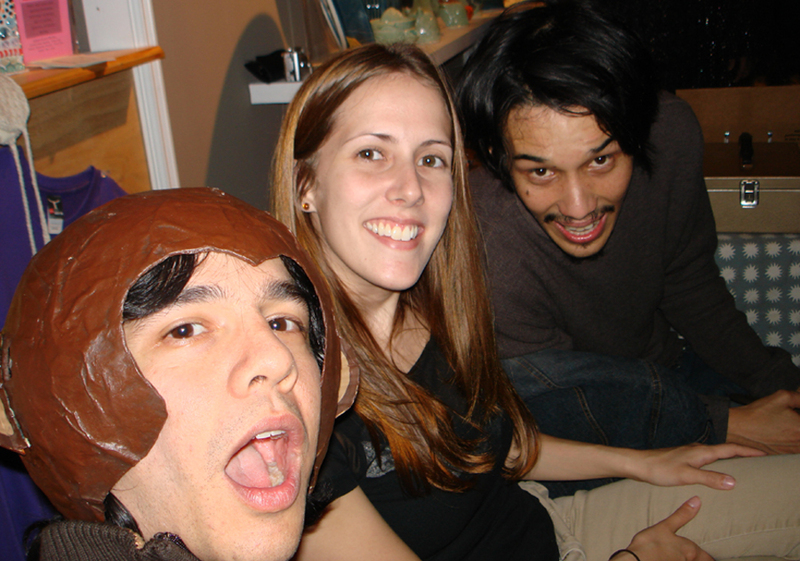 La Caballera was going to be titled something totally different - but unavoidably awkward. This piece is a culmination of visuals and text that I imagine our son would be dreaming at night. Diego is nine months old now, and I could only think that language and symbol must penetrate his dreams - where everything appears a beautiful and unending landscape. I was recently commissioned to design and paint a set of decks for Scientific Street Fighting. SSF provides athletic gear specialized for martial arts and "Vale Tudo" (anything goes unarmed combat). 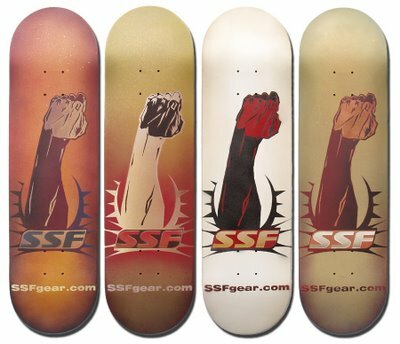 Based off of SSF's original logos, I created a set of three different stencil patterns and applied them to 8.25"x32" skateboard decks using spray paint. The greatest challenge of this commission was maintaining a cohesive color palette between all four decks while still having enough freedom to explore different color combinations. Special thanks goes out to Ron of Scientific Street Fighting. 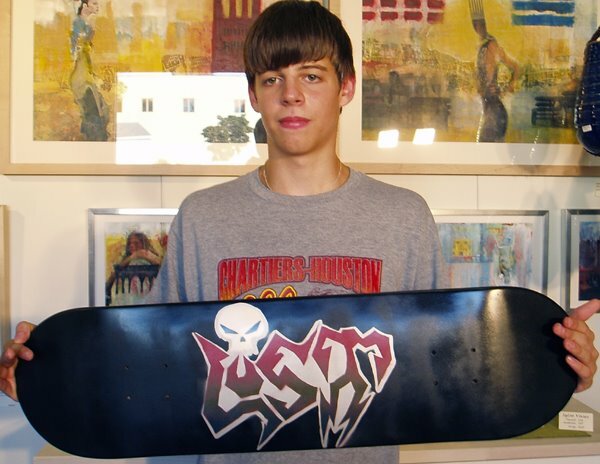 His interest in the PONSHOP decks brought about a whole new deck series for his business. August was a busy month for us. The PONSHOP held a combo "Intro To Street Art" and "Skate to Create" workshop. These classes were three 2-hour sessions where students either took a stab at creating poster-size spraypaint murals or designed and appplied a stencil graphic onto a skateboard deck. Good Work Guys! Ty'Rel used spraypaint and paint pens to create his "Tee-Kay-Oh" piece. 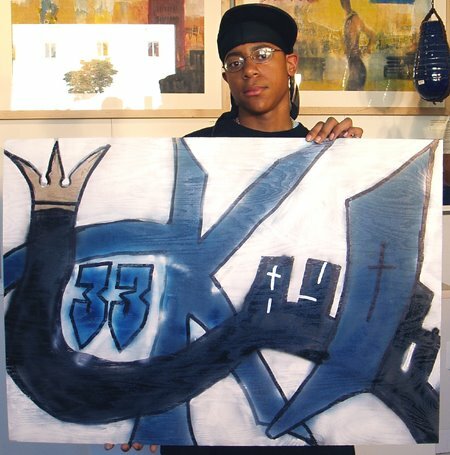 According to Ty'Rel, this workshop was just the beginning of his endeavors in large scale compostions. 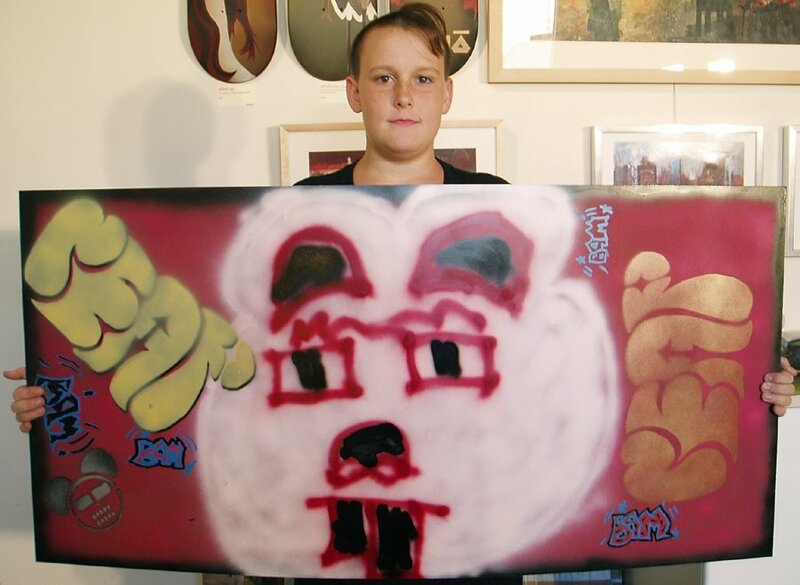 Brandon took a stab at using paper collage, spraypaint, paint pens, and stencils to execute his "ACE" piece. Brandon's biggest challenge was practicing a variety of line thicknesses with the spray can. The "Skate To Create" students had a very clear idea of what they wanted to do with their skateboard graphics. Their ideas were rooted in Grafitti murals, yet they had to reconstruct their sketches to accomodate three different stencil patterns. Robert's "Lost" Graphic incorporates a red to green gradient with a silver outline to contrast with the slick black background. 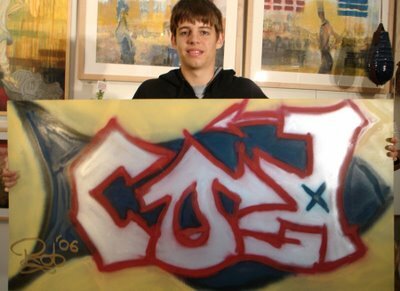 Tristan's "Core" graphic is inspired by the Grafitti's "Wild Style", incoporating stylized lettering and symbols like arrows and crowns.